Pollination via animal or physical pollinators is one of the most, if not the most important events in the life of a plant. It is how most plants, with a few exceptions, procreate. Especially annuals, whose life cycle ends with the production of seeds via pollination. Flowers have male and female parts. The male parts are called stamens that produce pollen. The female part of the flower is the pistil. The pistil has two parts, the stigma and the ovule. The stigma is at the top of the pistil and is where the pollen needs to get to for seeds to be produced in the ovule. When this occurs in the same flower it is called self-pollination. When the pollen from another flower is transferred to the stigma of a different flower it is called cross pollination. Cross pollination will produce stronger plants, but it can only occur between plants of the same species. Only pollen from another Apple blossom will produce fruit on an Apple tree, pollen from a Tomato plant will do nothing. Plants usually need action from an external source to ensure that pollination occurs. The external mechanism can be the wind, insects or animals. 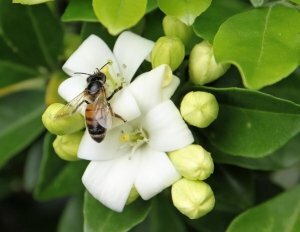 Plants have evolved and developed ways to ensure pollination. Corn, for example, relies on the wind. Pollen is produced by the tassels at the top of the plant and it falls onto the silk of the ears to produce the corn seed. Many other plants are pollinated in this way, but some have developed systems to attract animals and insects to do the deed for them. Fragrances, colors and nectar all attract pollinators to the flower where they receive a treat of pollen or nectar which makes them crawl around or otherwise transfer the pollen to the stigma, ensuring next year's crop. It is one of the wonders of nature that different plants have developed to take advantage of different type of insects and animals. It really makes you wonder if the plants evolved to take advantage of different types of insects and birds or vice versa. Honey bees have a shorter proboscis than a bumble bee or butterfly. Bees also have hairs on their hind legs that collect pollen. It is in the process of collecting nectar and pollen from each flower that the bee visits that pollination occurs. The bee has no idea of the role it plays in this process; she is only concerned with collecting food to take back to the colony. Butterflies and bumble bees tend to visit flowers where the nectar is deeper into the flower such as Morning Glories or Trumpet vines. It's when the insect lands and has to dig deeper for the nectar that pollination is achieved. The Honey bee is one of the most important pollinators simply because man has been able to manage them to provide large quantities of the insects at specific times for crops to be pollinated. There have been problems with beekeeping in recent years. The advent of several bee parasites as well as a phenomenon known as "colony collapse disorder" have combined to decrease the number of honey bees available for pollination. Now, the home gardener might have a hive or two in their garden to keep bees close by to help with pollination. If you do, bravo! Beekeeping is a fascinating hobby. Most of us do not keep bees, so we must rely on the natural occurrence of bees and other pollinators. One way that you can help stack the deck in your favor is to have plants that naturally attract insects and birds to your garden. Planting a butterfly garden will attract insects and birds that will visit all of your plants that have flowers. Inter-planting flowers in your garden will also attract them. If you must use insecticides, use them wisely. Over application and misuse of insecticides can kill beneficial insects just as easily as they kill the bad ones. A relatively unknown pollinator that can be managed by the home gardener is the Orchard Mason bee. This is a nonsocial native bee Osmia lignaria that pollinates our spring fruit trees as well as flowers and vegetables. A gentle blue-black metallic insect, they live solitary lives. In the wild they seek out hollow stems, woodpecker or insect holes in trees. At times you may find many individual nest holes grouped together, but the bees act strictly on their own, unlike honey bees which have a definite social structure in the hive. They also produce no honey, relying instead on collected pollen to feed subsequent generations. Also, unlike honey bees, they are active for only a short period of the year in the spring and produce only one generation per year. They are not aggressive and can be observed at close range with little fear of being stung. This makes them a good addition to our gardens. North Carolina State University has an excellent fact sheet on Mason bees. Another excellent resource for information about pollinators is the website of the Pollinator Partnership. This site has regional pollinator guides that you can download as well as lots of information on the state of pollinators in our country.